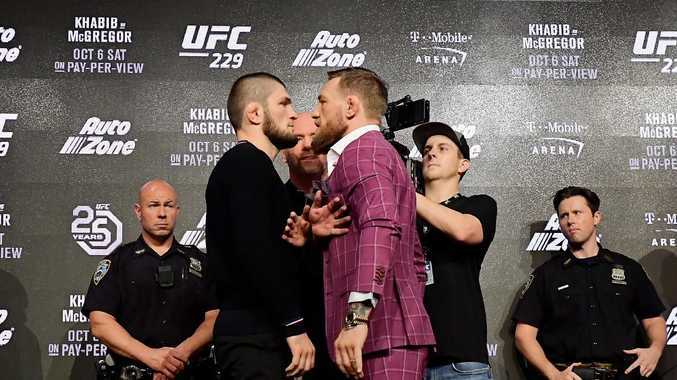 There is no love lost between Conor McGregor and Khabib Nurmagomedov. Khabib Nurmagomedov has responded to Conor McGregor saying that he was 'b****ing' through their lightweight world title fight at UFC 229. McGregor, 30, took a swipe at the UFC champion and boxer Paulie Malignaggi, 38, on Instagram. The rivalry has been brewing since last summer when Malignaggi became McGregor's sparring partner before the Irishman cashed in on a money-grab boxing cameo against Floyd Mayweather. Things turned sour when the UFC star leaked pictures and footage of the spars with a disputed knockdown of Malignaggi, prompting the Brooklyn boxer to leave Team McGregor's camp. In the post McGregor said: "I like Paulie Malignaggi" - before then calling him and Nurmagomedov 'broke b*****es." "Don't be a b****, b****ing. The same thing I said to Khabib at the end of round 3, my round. Don't be b****ing," McGregor wrote. "Every single round b****ing to the referee. He was even bitching in the fourth round from mount position. It baffled me. "If anyone should have been saying anything to the referee, it should have been me in that 1st round. That round he held onto my legs for four minutes straight. With zero activity. "But a fight is a fight who gives a f***. Crying to the referee like a proper b****. I was trying to dig my fingers into his Adams Apple. "Many individuals in the fight business, I have learned lately, are absolute b****es. I know you's are broke boys. But don't be broke b****es." Malignaggi also took to Instagram, calling McGregor "cowardly" and "a pinata". "For a guy that posts about b**** or b*****n an awful lot, it seems this guy doesn't have a proper understanding of what the word means. "So I found a recent clip of him exemplifying its definition in one cowardly act. "I give him credit though. For a guy with absolutely NO BALLS, the woof tickets he sold to all you stupid motherf*****s in recent years is amazing. "He's got a great talent for being a great bull**** artist. "(You) can be rich, but you (definitely) a b**** you cokehead lush. So don't let that s*** you ingested on your Friday night cloud your memory of reality."